The longest river in Poland, the Vistula (or 'Wisla' in Polish) winds its way all the distance from the Beskidy mountains of the south to the Bay of Gdansk on Poland's northern coast - covering the whole stretch of this large country. 1,047 kilometres (678 miles) long and draining an area of 194,424 km (75,067 sq. miles), the Vistula is a vital source of life and transport and beauty in Poland. Whilst the historic records of the Vistula tend to be unreliable, we do know that the origin of the river's name is probably Indo-European - though obviously the title 'Wisla' is a Polonized version. Previously the Vistula used to be connected to the Dnieper River, and through it to the Black Sea, where it was part of the 'Amber Road' - an ancient river trade route from the Black Sea to the Baltic Sea. 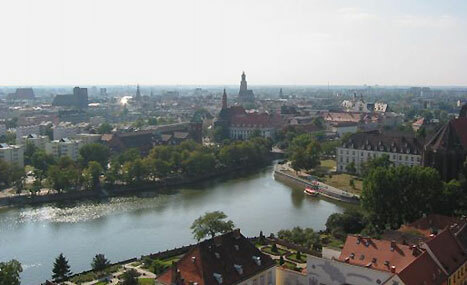 Today, the Wisla is part of the landscape of many of Poland's most important cities - such as Krakow and Warsaw - and whilst in past times this mighty river was a great source of recreation for Poles young and old, we wouldn't recommend bathing in it today - the communist era has rendered it polluted and dangerous to swim in. However, if you want to discover some of the Vistula's scenery up close, why not take a Vistula cruise in Krakow or check out the Vistula River Museum in Gdansk? The Vistula has a history of salt, grain and timber rafting - to this day (albeit more for tourist purposes than practical ones) you can drift along the river on one of these rafts, with some very historically (it's a lovely outfit) costumed men. These rafts were used extensively in the past for trading goods & transport. As mentioned, the river was a section of the Amber road - Poland played a huge part in the 'Amber Boom', selling, finding & buying, and this amber was traded extensively throughout Europe via this 'Amber Road'. River craft and boat building were a large industry and today the main shipping port of Gdansk is still very much in operation, however differently it may be equipped and the use of it may be employed. This would have also helped to develop these port towns as to accommodate the huge river trade; shops, bars, cafes & hotels would have multiplied very fast to accommodate the workers and travellers, as well as grainaries and storehouses. It has been and still is used for fishing and swimming, although in the more polluted city areas, not so much. The Wisla, in winter, is in many hardened areas, used for ice skating. It is expected to flood the areas around itself by 2100 due to Earths currently rising sea levels (oh no, that's bad news for my apartment!). There are many legends surrounding the river. One is that princess Wanda, upon her fathers (King Krak) death she became queen and refused to marry a German Prince called Rytigier. So, this German Prince invaded her territory. The managed to push the guy off but Wanda jumped into the river and drowned herself anyway. Another is of a Warsawian mermaid. The Wisla is used for drinking and in fact Poland is famous for and very proud of it's many mineral springs. There are many spa towns in Poland (prominently) along the Dunajec, which is a tributary of the Wisla) which produce and bottle this mineral water. Many of these springs are considered holy and healing, and likewise each spring scientifically beneficial, with it's own medicinal recommendations and uses due the unique mineral levels of each. I was born in England , however my family is Polish so I speak English and Polish. I am proud to be Polish. In 2017 I will be 11!!! My teacher gave me a task from year 5 about rivers so I picked my favourite!!! WISŁA !!!!! Cześć uwielbiam wisłę jest przepiękna!!!!! :) :) :) :) :) :) :) :) :) :) :) :) :) :) :) !!!!!!!!!!!!!!!!!!!!!!!!!!!!!!!!!!!!! I liked that the info was somehow good but I was looking for the uses of the river for example more attractions or is it used as a water source. Well, it has a history of salt, grain and timber rafting and even today (albeit more for tourist purposes than practical ones) you can drift along the river on one of these rafts, with some very historically (it's a lovely outfit) costumed men. These rafts were used extensively in the past for trading goods & transport. As the article mentioned, it was a part of the amber road - Poland played a huge part in the 'Amber Boom', selling, finding & buying, and this amber was traded extensively throughout Europe via this 'Amber Road'. This would have also helped to develop these port towns as to accommodate the huge river trade, shops, bars, cafes & hotels would have multiplied very fast to accommodate the workers and travellers, as well as grainaries and storehouses. It has been and still is used for fishing and swimming, although in the more polluted city areas, not so much. River craft and boat building were a large industry and today the main shipping port of Gdansk is still in operation, however differently equipped and the use of it may be employed. The Wisla, in winter, is used for ice skating. It is expected to flood the areas around itself by 2100 due to earths currently rising sea levels (oh no, that's bad news for my apartment!). There are many legends surrounding the river. One is that princess Wanda, upon her fathers (King Krak) death she became queen and refused to marry a German Prince called Rytigier. So, this German Prince invaded her territory. The managed to push the guy off but Wanda jumped into the river and drowned herself anyway. The Wisla is used for drinking and in fact Poland is famous for and very proud of it's many mineral springs. There are many spa towns in Poland (prominently) along the Dunajec, which is a tributary of the Wisla) which produce and bottle this mineral water. Many of these springs are considered holy and healing, or otherwise each spring scientifically beneficial, with it's own medicinal recommendations and uses. Did I satisfy your curiosity or would you like some more information?